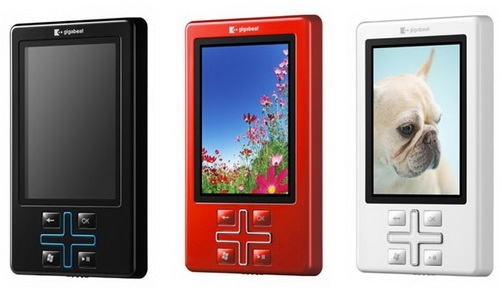 Toshiba's Gigabeat T401: Is This the Next Zune? "Toshiba this morning added a new mid-size flash player to its Gigabeat line. The T401 balances the differences between the small Gigabeat U and the company's hard disk players, sporting a 2.4-inch tall LCD and 4GB of flash storage that cuts the thickness to under 0.4 inches. Unlike most of Toshiba's players or even the Microsoft Zune, however, the T401 supports not just 802.11g Wi-Fi but also an Internet connection; listeners can download podcasts directly from websites without first synchronizing with a PC." There's a lot of speculation about the T401 being the future Flash-based Zune we all know is coming. Because the first-generation Zune was an off-the-shelf Toshiba product that the Zune team just grabbed and slapped their logo on, most people seem to be speculating that the next Zune will be the same. I'm not so sure - it really depends on how quickly the Zune team has been able to get started working with the manufacturers in China to design their own product from scratch. Given the lack of new features coming via ROM updates, I sincerely hope that's the case and they'll have a unique product to bring to market this fall. If not, and we see this Toshiba Gigabeat T401 with a Zune logo on it, then I for one will be disappointed.